Updates to Darrell L.'s profile since your last visit are highlighted in yellow. Darrell L. Stinger has a birthday today. 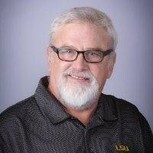 Patte Marshall Michel posted a message on Darrell L. Stinger's Profile. Darrell L. Stinger added a comment on Profile. Joe Finnegan posted a message on Darrell L. Stinger's Profile. Happy Birthday Darrell !!! Was great seeing you at the reunion and poker game. Darrell L. Stinger added a comment on Profile. New comment added. Monthly Poker game in my basement. From left - Chris DeWitt, Gary Rohland, Rob Stinger ('67), Tommy McPhillips, Tom Westervelt ('68), Darrell Stinger, and me. Happy Birthday, Darrell. Hope you have a great Holidays !! !